To view the brochure, you must have Adobe® Reader. Click here to download. ... to West Michigan Ear, Nose & Throat. The simple fact is that ear, nose and throat health are intricately connected. Like a series of branches in a forest, the systems of the body are inter-related, with one leading to another. It is that understanding that allows us to provide the very best care for our patients, guiding them on a clear path to feeling better. NEW Treatment Option for Recurrent & Persistent Sinusitis Sufferers! 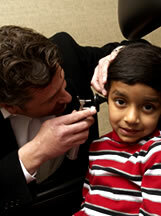 We can help with your Hearing Aid needs! "We know our son is getting the best care. The specialists at West Michigan ENT are friendly, knowledgeable and stay on top of current trends in the field."